(1) Who? If you don't have a particular author or illustrator in mind, providing us with details about what kind of presenter you are looking for can help us find you the perfect author for your event. (2) What? Think about what you want your event to entail. Even if you don't have all the specifics, knowing what kind of event you want to hold and what your guests will take away from the event is half the battle. (3) Where? Do you know where you'd like to have your event? Determining the venue can help you choose a direction to go in with your event. (4) When? If you not yet know the exact date, try to have a few possibilities in mind to suggest to the author. (5) Budget. Travel costs, honorariums and book purchases are part of the majority of great events. Knowing what your budget is in advance can help us negotiate the cost of your event, as some authors are flexible with honorariums. (6) Confirm with your author once you have received a confirmation from us. We will send a written confirmation containing all of the details of the event, as well as contact information for the author. Then you can plan the final details of the event with them directly. (7) Book sales. Order books for your event and receive up to 50% off. This is a great way to offset the cost of your event. (8) Promote. Tell local newspapers, make up fliers, update your blog, and do whatever you can to spread the word. (9) Prepare. 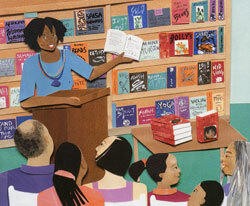 If this is a school event, have the children read the author's books beforehand, so they are familiar with their work. Then they can also have questions prepared to ask the author/illustrator. (10) Have fun! We will do everything in our power to help you plan a fun and successful event. Then all you need to do is sit back and enjoy! If you would like to set up a school, library, bookstore event, or need ordering information, please contact 1-888-320-3190 ext. 29 or write us at publicity AT leeandlow.com.